I give you the best wines to buy on a budget, especially if you're a busy mom like me! The week was going slow, until Wednesday hit and now it’s like the week just started! Last night we had a dinner party for a couple of friends. One of them is going to have her baby next week, I’m so excited to be able to hold a little one again! Braedon is getting too big! It makes me really sad. Cool thing about our dinner party is that I snapchatted how to make the raspberry and chocolate tart. And it.was.amazing. On this Afterdark special, I’m going to give you my little secrets, my favorite ‘cheap’ wines, for the every day week. The kind of wine that you can drink after you put the kids to bed or if you are on a budget. Beware, I am really picky with my wine, so there aren’t many. But the ones that I chose are pretty much the best that you can get under $20. 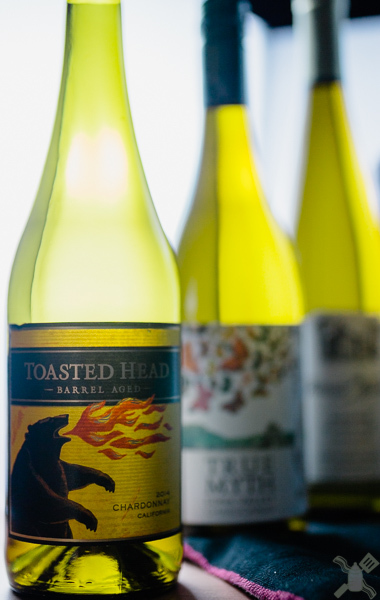 My main go-to is the Toasted Head Chardonnay. This is one of the most drinkable Chards that I have ever had without being overly sweet. It has a dry nose, but a sweet taste. This wine can get you into trouble, if you’re not careful. It’s easy to keep drinking it, as if it were non alcoholic. And then, all of a sudden, you’re drunk. Which I don’t much like. A nice glass of wine is fine, but getting fuzzy headed is not always okay. But at about $7.50 a bottle, this is a value that you cannot beat! My next favorite is another Chardonnay called True Myth, it’s another Chardonnay. This one is much sweeter than the Toasted Head. Although it’s not as sweet as a port, it is definitely something that you can’t have many of without feeling like you have drank too much sugar. This one is aged a little more than the Toasted Head, but only costs $1 more. I definitely suggest this wine if you like a sweeter drink. The sweetest out of all of the white wines is a Riesling from Chateau St Michelle. Rieslings are generally sweeter. I only can drink one of these bottles maybe a month and very slowly. It’s almost port like in it’s quality. It is something that you drink for dessert or lack thereof, maybe. This wine hits you at $6 a bottle. It has a lower alcohol content and is definitely for sipping. Finally, the only red wine on my list is the Bogle Old Vine Zin. This has such a good body. If you put this up against a $40 bottle of Zin, you wouldn’t be able to tell the difference. It’s got a very dry tongue and taste of blackberries. This wine comes in at the cheapest of $6.00. These may not be the best of the best, but they are the best of the cheap wines that you don’t have to feel bad about drinking. On a side note, has anyone heard about My Chemical Romance? They are getting back together! The little emo teenager in me is screaming! I’m hopefully getting some content for September all planned out, these things really excite me! Follow me on Instagram and Twitter for all of the latest news!